Whaler 401 is a one-bedroom, two-bath direct ocean front condominium located in Tower 1 on the 4th floor. 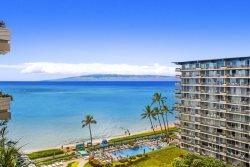 This suite offers sweeping views spanning from Black Rock to the north, across Kaanapali Beach and beyond to the neighbor island of Lanai and up to the lush West Maui Mountains. Sit on the wrap-around lanai and enjoy full afternoon sun, sunsets and whale watching in season. King bed and a Queen sofa sleeper. All Whaler units feature full kitchens, full baths, central air conditioning, free Wi-Fi, and a large private lanai (balcony). You have the assurance of having an on-island manager with over 30 years of experience to make sure you have the very best vacation experience. We choose this property over many others because of the view. It did not disappoint. Excellent ocean AND mountain views from the very large lanai. It was so relaxing to hear the surf during the day and night even with the doors and windows closed. We will stay here again. At the Whaler, overall the huge lanai, awesome views, and location can't be beat. Love the island of Maui. Have stayed at the Whaler Condominiums for 37 years now and stayed in many of the various units, some excellent and some average, but overall very good standard and have all the facilities required. Would definitely recommend the Whaler as a place to stay. Lovely situation on Kaanapali Beach, central to shops, restaurants, etc. Great stay as always.